We spend most of our energy at this site exploring bags and satchels that serve a broad cross section of the male population. But men hesitant to jump on the man-purse bandwagon should be aware of the myriad specialty man bags that have provided for the extremely particular needs of male workers conducting important, technical, and (need we say?) manly work in a number of enviable professions. The recent popularity of man purses in the more general population would not have been possible, we believe, without the pioneering work of —for example — plumbers, military strategists, or mail carriers. The reuse of bags from these and assorted other occupations provides cultural cover to the nonspecialist wearer, allowing him to tote what is clearly a man purse but to claim to others or convince himself that it is something else entirely. As long as they are recognized as such, specialized bags worn by nonspecialists draw their power and justification from their original use. It’s no different from fashion: The professional costumes we copy provide an excuse for us to wear items that otherwise might appear entirely ridiculous. Eventually, as more and more people imitate the look, a getup will ultimately become accepted as . . . well, passé. There is, of course, plenty of middle ground between “authentic” wearers of a specialty bag and their imitators. We might not be in the military, but carry a military-style map case with us to . . . hold some maps. Or in our Czech plumber’s bag, we might carry . . . some plumbing tools. Really, is that so wrong? 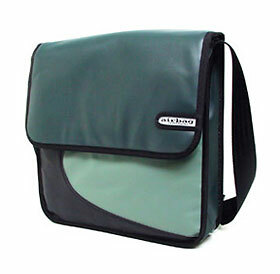 In this spirit, then, we’d like to introduce the mainstay of Eighties techno-music fans everywhere: the DJ bag. And to introduce at the same time a small German manufacturer doing its part to provide some of this “crossover credibility” to non-DJs who simply want to lug large and heavy loads at their sides. The company is Airbag Craftworks, a design house with a wide variety of interests, as evidenced by its occasionally bewildering, Flash-heavy site, which features artful slide shows, strange interactive games involving flying man purses, and electronic-music compilations — all set to selectable beats from a built-in jukebox. And while they do sell bags for carrying large numbers of records, in “geiger 12-inch” (holds 40 LPs), “classic 12-inch” (holds 50 LPs), and “super 12-inch” (holds — ouch! — 90 LPs) models, our focus naturally settled on the bag they call the Vinyl Shopper, a much slimmer model with cushioning and three subdivisions. The company calls the Vinyl Shopper a “useful bag for recorddiggers.” Hey, we all dig records, don’t we? If anyone asks what you’re doing with such a big bag, here’s your line: You’re out shopping for LPs. Vinyl. For that club you’re going to open. And this bag is just the right size. Maybe you can even keep an old album cover in there just to prove it to the fashion police, when they pull you over. This entry was posted on Thursday, April 27th, 2006 at 10:47 pm	and is filed under Commentary, DJ Bags, Fashion, Man Bags, Manufacturers, Military Bags, Recycled Materials. You can follow any responses to this entry through the RSS 2.0 feed. You can leave a response, or trackback from your own site. What? No comments about “pulling out your big 12-inch” — from your manpurse?